For those who have trouble falling asleep, awake exhausted, or are awakened throughout the night by a restless or snoring partner, help is here. Do you take a long time to get up and get going in the morning? Do you wake up feeling like you barely slept at all? Do you wake up in the early morning hours and find it difficult to go back to sleep? Do you have uncomfortable feeling in your extremities that keep you from falling or staying asleep? Do recurrent nightmares disturb your sleep? If you or someone you love has trouble sleeping, Dr. Robert S. Rosenberg will help you identify the problem and provide targeted solutions so you can start awakening refreshed and renewed immediately. Based on the most recent research and including real patient stories from Dr. Rosenberg’s practice, his new book discusses the most common causes and symptoms of each disorder, answers the most frequently asked questions about each and provides the latest solutions to help you finally get a good night’s sleep. A sleep specialist and researcher, Rosenberg also shares the latest research on the connections between sleep disorders and PTSD and ADHD. And his ten-point plan for getting your best sleep will help you improve the quality of your sleep and your health and mood right away. From increased appetite and diminished immune function to hallucinations and tremors, short nights can pack a hard punch. 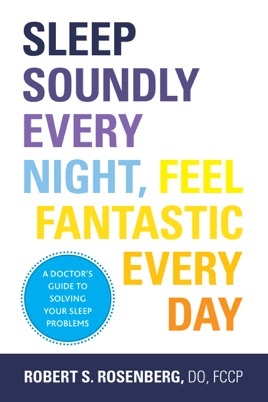 So says sleep disorders pro Rosenberg in this practical guide to getting a good night's sleep. Using simple language and a conversational tone, the author extols the far-reaching benefits of restorative sleep; warns of the damaging effects of restless nights; and uses actual patient stories to illustrate a laundry list of disorders. Rosenberg begins with a self-test for identifying symptoms and pinpointing specific problems like sleep apnea, circadian rhythm disorders, and night terrors. Readers are then directed to the sections of the book most useful to them, where more specialized information and advice for seeking additional resources can be found. Rosenberg also delves into serious issues like night eating and sexsomnia and offers readers the tools for understanding the delicate confluence of sleep disorders and psychiatric diagnoses (PTSD and ADHD in particular). With its wealth of easy-to-understand information, the book is an invaluable reference for anyone who has suffered through sleepless nights.